You need to understand that this friend’s Dad used to work for My great Uncle Fred Lowry who was married to Kate Lowry that is the Aunt Kate that gave Dad’s Mom this house. 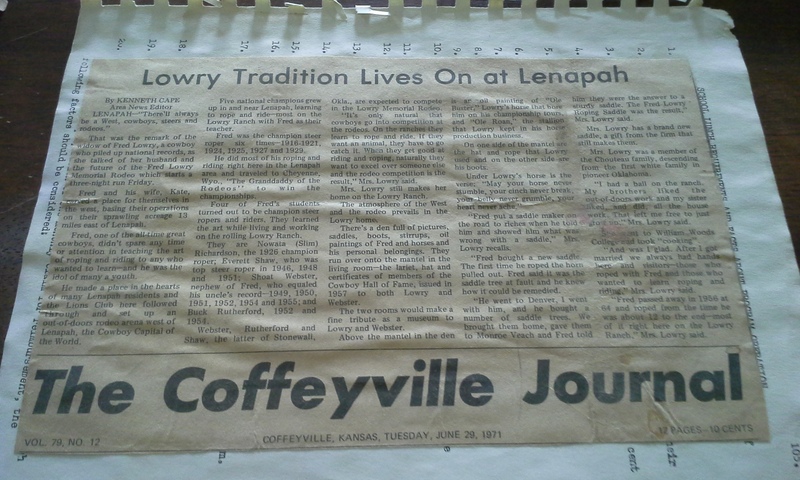 With that in mind the thing that started it all was this … an article about Fred Lowry, Dad’s Great Uncle. 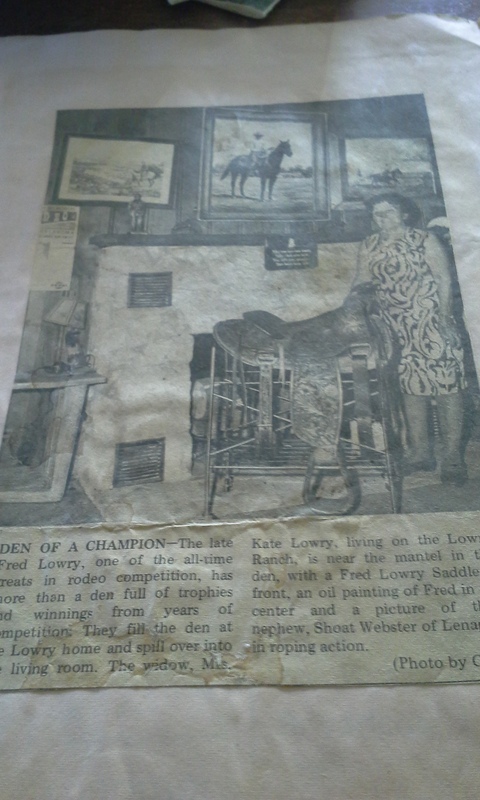 That is Aunt Kate in the picture and she is the one that gave Dad’s Mom this house. 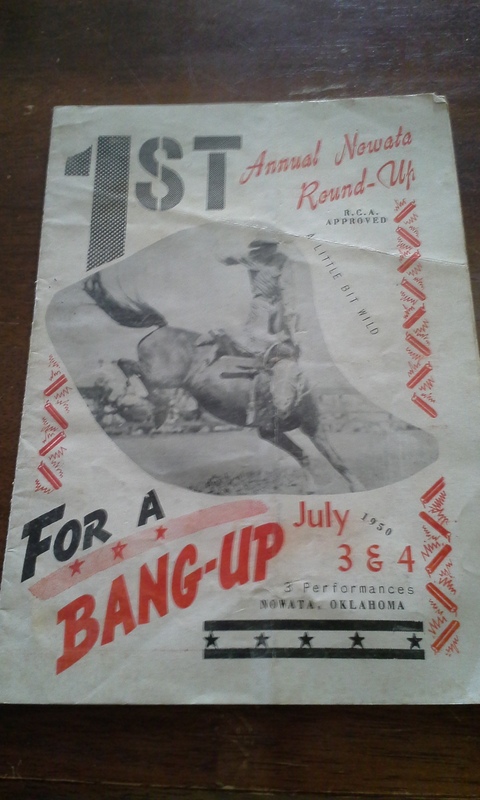 Then there is the first Rodeo program from Nowata Oklahoma. That is our home County Seat and used to be our home town … When we say we are headed to town that is normally where we are headed. 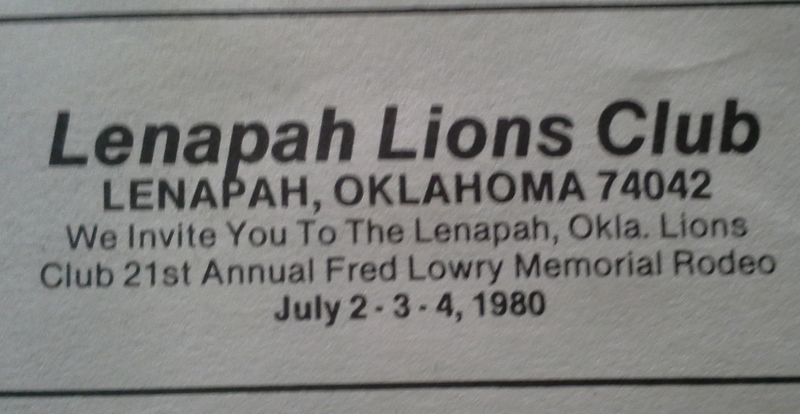 Inside the program are things like the advertisement from the Fred Lowry Roping. Then remember the Cowboy that helped Mom and I with our flat on the trailer on the way to get me to a roping a while back??? 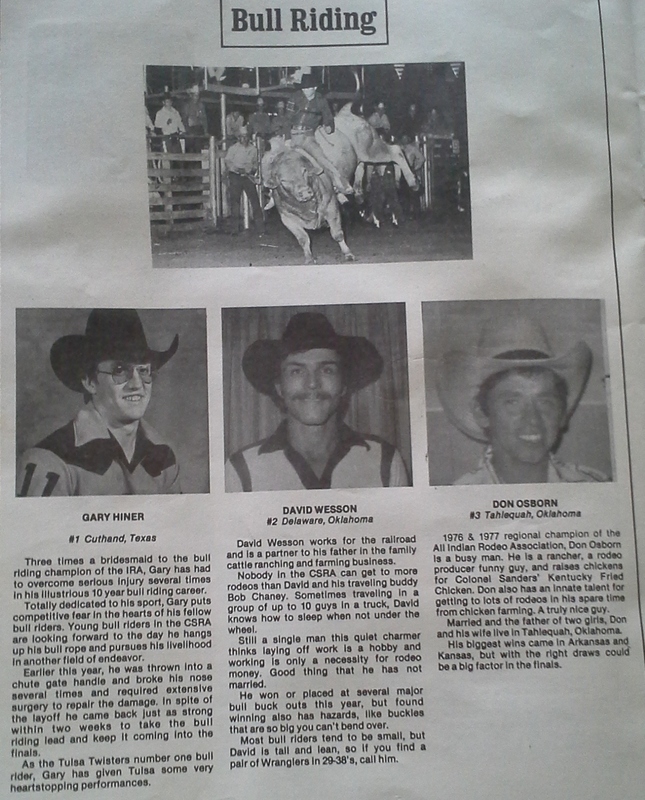 Well, here he is (middle) … In the old days he was a local hero by way of being a bull rider. Now he is just a quiet one that changes a tire! 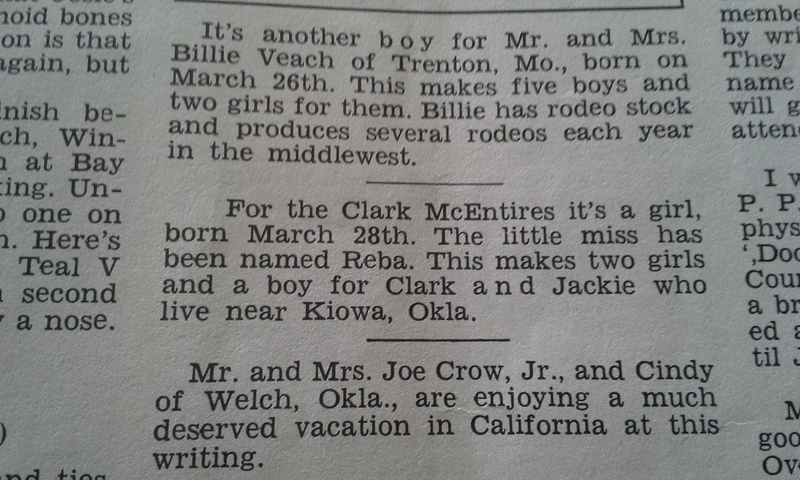 There is Reba McEntire’s Birth announcement … Her dad Clark, roped with Great Uncle Shoat. 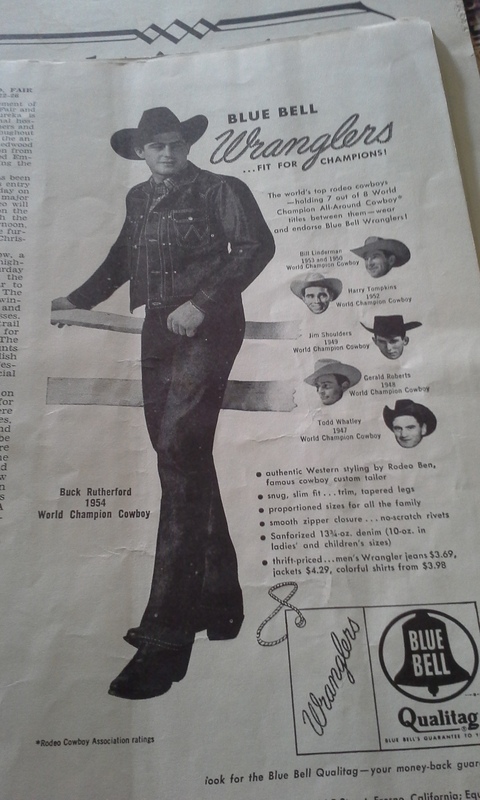 There is a Wrangle ad with Buck Rutherford … He was a friend of Shoat’s and Fred’s and a really good roper. And that is just the tip of the ice burg. 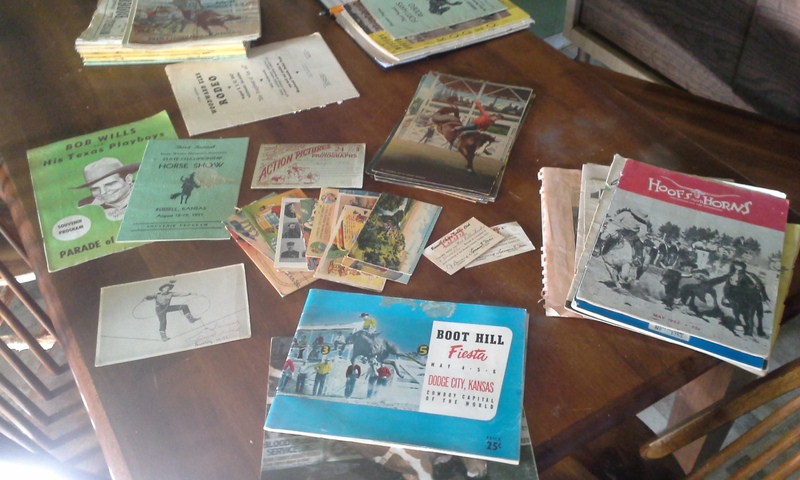 There is a ton of treasure that Dad and I spent all day sorting through. 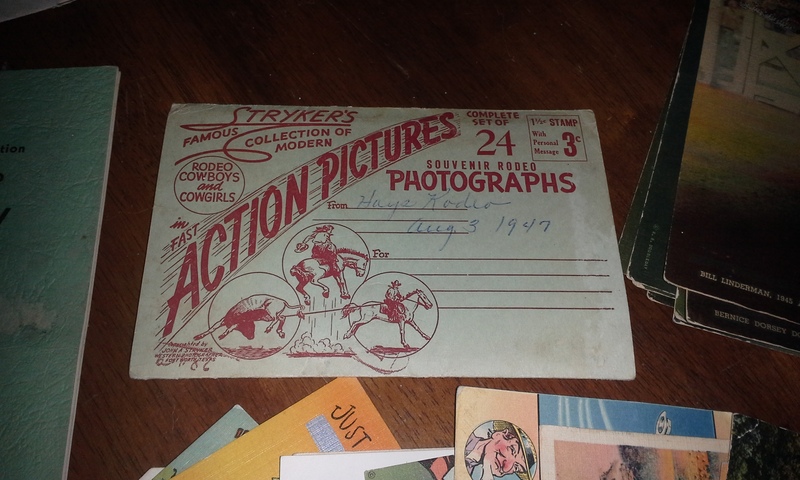 There is even a ton of old post cards. 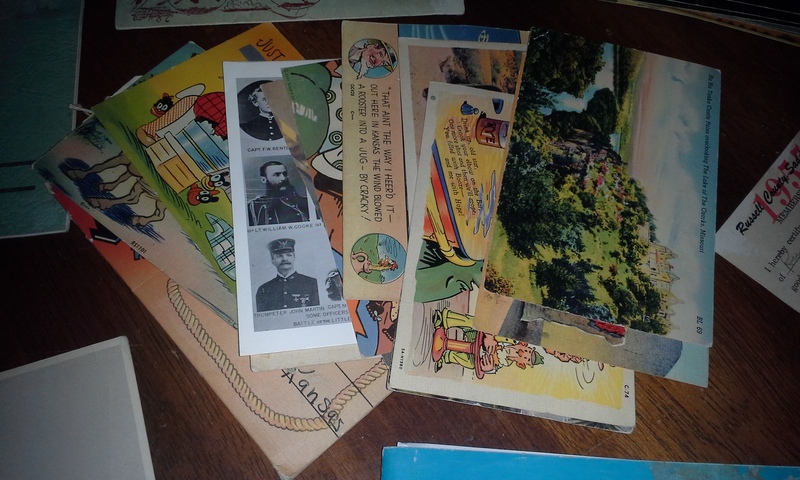 Mom says that she has a few plans for our treasure that will be framed and displayed here in the house. I think it is going to be so cool. I know I have been gone from the blog for to long but this is one time that I can say nothing really happened here that was to exciting. The one thing that has taken all my time is the haying season. When the temperatures were hot we spent the days cutting and baling the hay. However, by night we could be found hauling it in. Then this last week the weather flipped on us and we had to work when the dew was off everything. 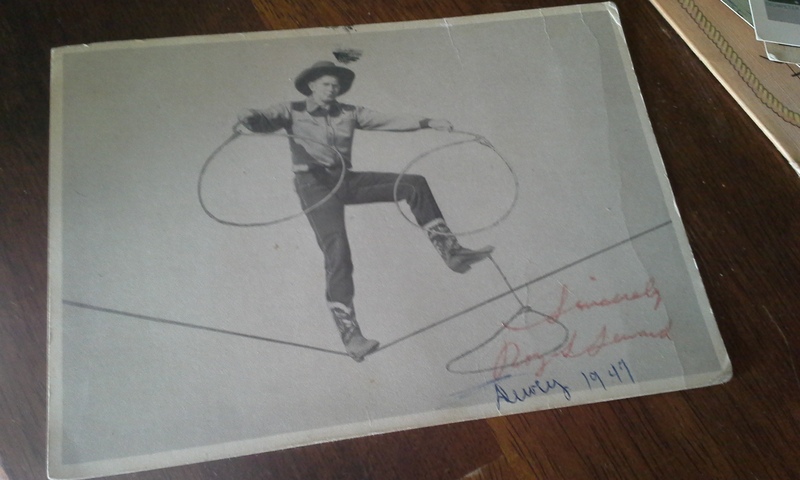 Even my Roping has gotten all turned around. Most weekend I don’t get home and in bed until well after 3am. Simply put when I am not in the hay field I am roping, eating or sleeping. Mom has taken on all the day to days around here for the most part. I have had to stop and help her from time to time with this or that but then again she drives the truck for us to haul on and she helps kick the hay off to us for stacking. All in all I think the labor evens out. While we still have one more section of hay to get down and in the barn, one thing that is of interest to all my fiber and animal loving friends out there is starting today! Yup, today Mom and I are taking on the task of sorting and getting the first of the breeding pens started. One is the Goats. This year we are not breeding any angoras. Little Ash from this spring isn’t taking the heat so well. He is eating and drinking but he isn’t his spry self and no one can figure out exactly why. So Mom says after what happened with Grace last year and Now Ash not being up to snuff, she is done Breeding Angora Goats. 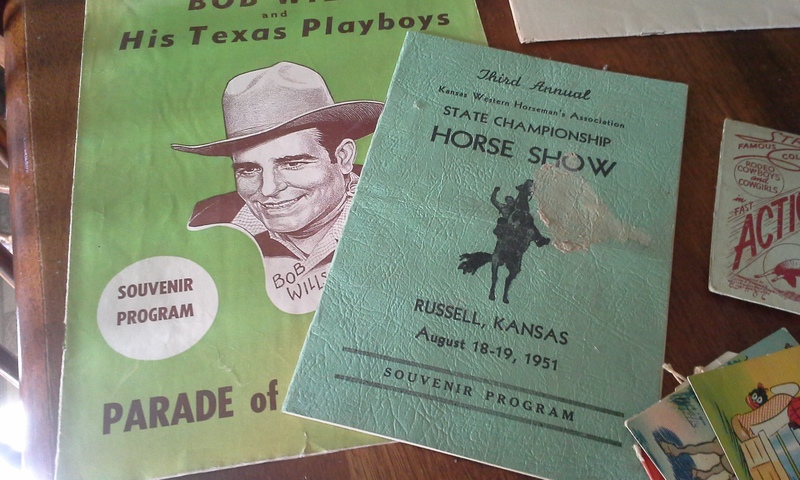 We will however, still be breeding The Cisco Kid to our milk goats. So there will be baby goats just not angoras. The other pen that will start today is the Merinos and the Meat Sheep. This year we will be using Rammie and then he will be Withered. Knight has had a bit of a set back with his leg so we are trying to get that all cleared up before we make him breed. His hurt leg on the back and he can’t really stand on one leg to breed so he would probably do more damage then good if he did try. Anyway, Rammie is this year’s Ram of choice for that reason. And if Knight’s leg doesn’t heal up right for whatever reason … he will be withered too. The final Pen that I sorted today is the pasture. It is time for Mr. Zebu to go play with the girls. And trust me he is ready!!! When I turned him out he went snorting and bucking all the way down the arena. This also means that either tonight or tomorrow B’Day will be going to play with her Bull Friend. This time she will be with him in a smaller pen so we shouldn’t have a repeat of last year …. LOL. First, as the first round of hay was cut Mom and I cleared out the barn of the last 50 bales left over from last year. In order to do that we called our horse trainer. He feeds about 200 bales a month so he can use the hay up fast and he always needs it. While we were moving the hay out we found a Hen sitting on a nest and one baby chick. We saved them all and put Henny on Daisy’s old nest since she was no longer sitting on it. 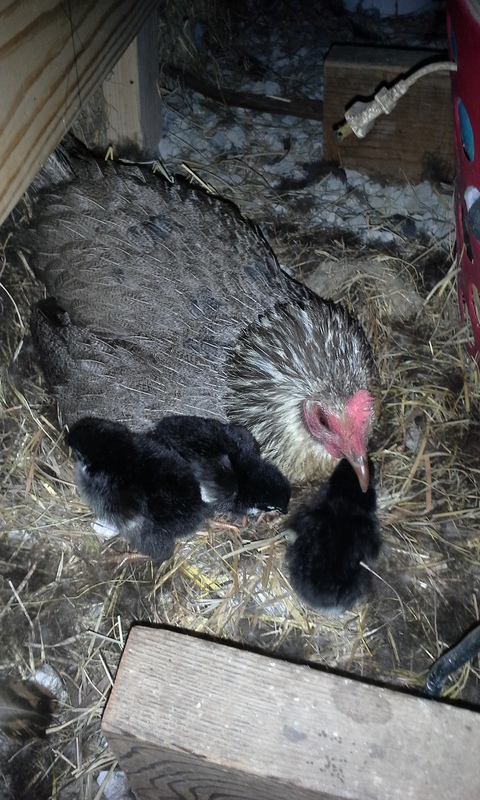 In the end we have three new chicks. They are so Cute. While Kevin was here he did an interview for a future post on youtube. He also took time to check Derf out. We think he likes how he is doing as when Kevin was here Derf was in the pasture. Kevin also got to check out the Donkeys. After he was gone he had time to think about it, he decided he wanted to be Jack’s forever home. Kevin called Mom and let her know and yesterday Dad and I took Jack to his Stables. 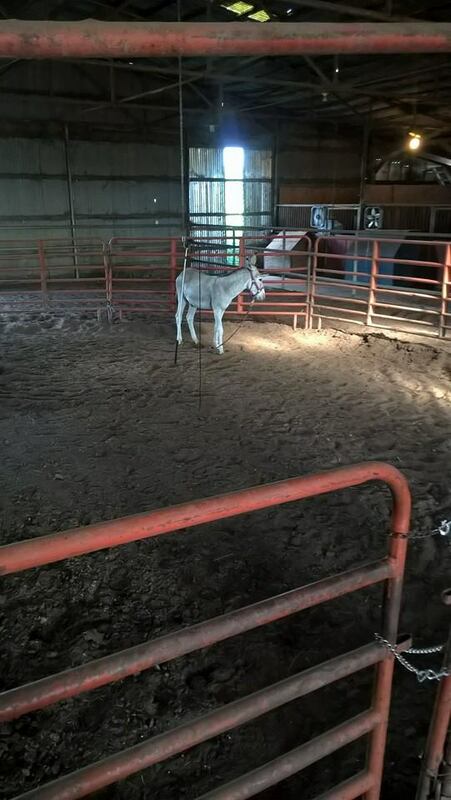 With the stalls in the barn empty Mom and I decided it would help Precious to be in the barn and around People more so we moved her in. She was really jumpy the first few days. After that she has gotten her lovings everyday and she is doing much better. Not like a normal loved horse but Much better for her. 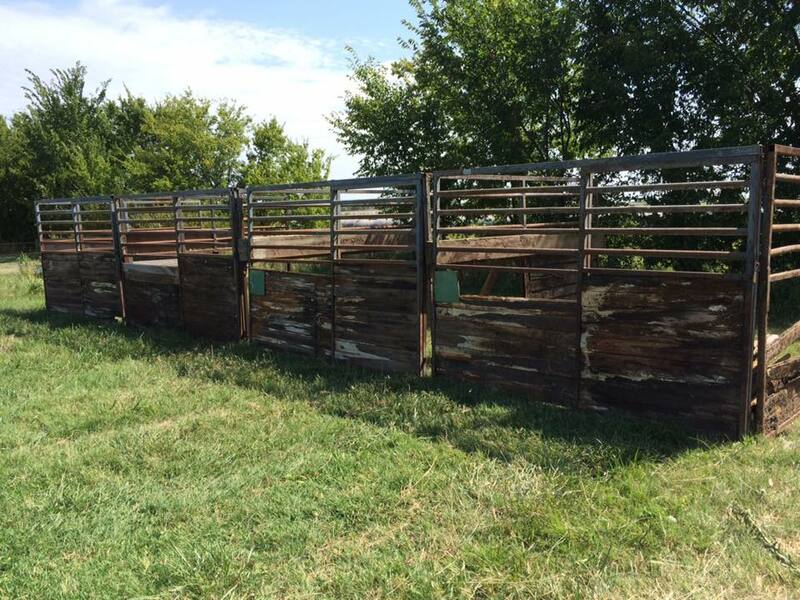 Another thing that came from this hay season already is that I managed to get 4 – 10X10 horse stalls. How did I do that??? I traded some hay for them. 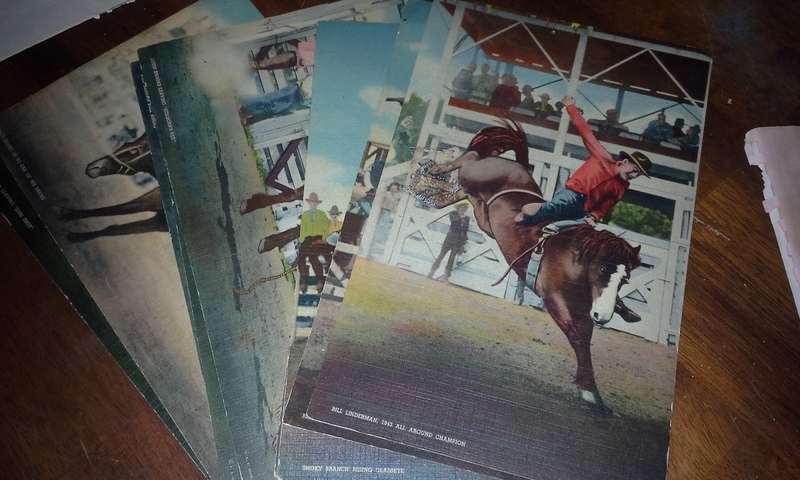 Mom is going to let me put them up under the awning outside the barn for now. They do need some work though. The wood isn’t any good but Mom and I plan to redo the wood and the Paint on them. By Night we had been hauling in over 700 bales of hay so far. It makes for long days and short nights and about a 3 hour nap window in the heat of the day. 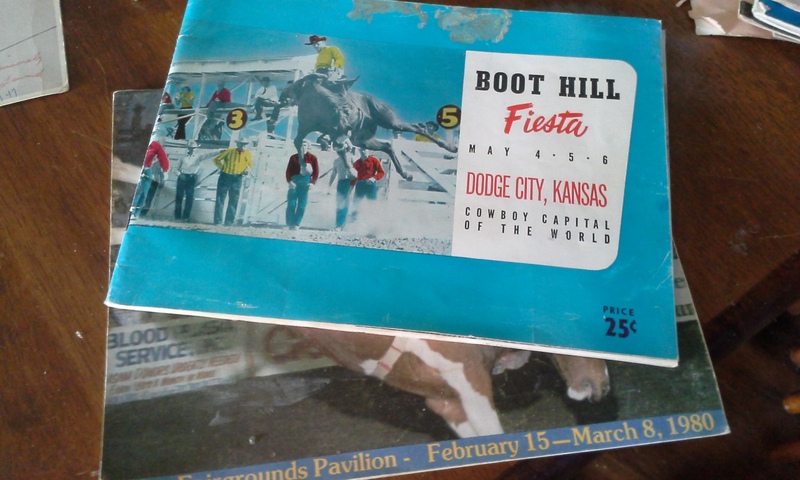 And Yes I am still Roping on the weekends. Last weekend I brought home a paycheck that was enough to keep me going this weekend and last night I got a small paycheck as well. All in all it is one of the busiest times on the farm, Second only to lambing season!! !